Holidays with children under five can be a daunting thought. Babies and young children are so unpredictable and you need so much stuff! Thankfully, Canvas Holidays was one of the simplest and easiest family holidays we’ve even taken. We’ve just returned from a week in the south of France staying at Camping la Sirene. It was a gorgeous campsite with loads of activities and an incredible pool complex that keep our boys, George (3) and Joseph (nearly 2), busy for the whole holiday! We stayed in a 3-bedroom mobile home which made the holiday even easier. Both kids had their own bedroom, an unusual treat for a holiday as we’re usually all crammed into one room together. It meant everyone slept well and we had plenty of space for all our stuff. Self catering holidays are also much easier when you have young children. Toddlers are notoriously fussy, so being able to prepare your own jam sandwiches (with a very particular type of bread and the sandwich cut in a very specific way!) makes life a lot easier. If you’re travelling with babies you can prepare your own bottles or pureed foods and you don’t need to worry about disturbing anyone with the 2am feed! It also means parents get more of a break as you can put the kids to bed and then sit outside, open a bottle of wine and get the BBQ on. Anyone who has tried to go out for dinner six nights on the row with two toddlers will know this often isn’t a relaxing experience! 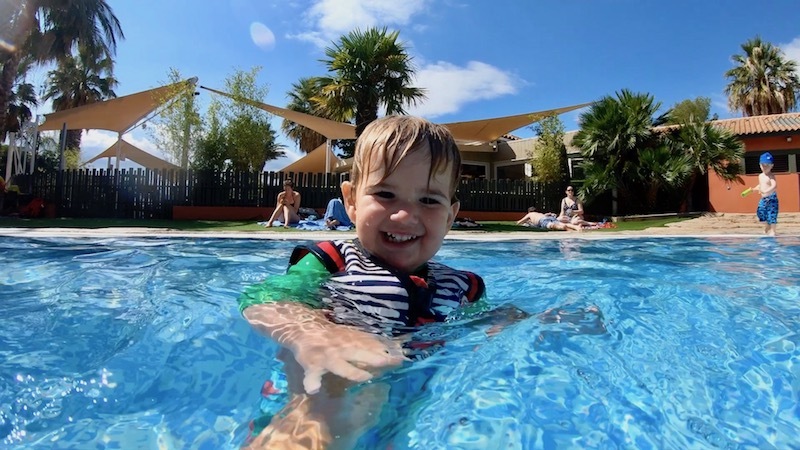 If you’re planning a holiday with Canvas Holidays, here are my tips for anyone travelling with babies and children under 5. We noticed a lot of people drove to the Canvas Holidays campsite and made the journey there part of the holiday. If you don’t drive there, I highly recommend hiring a car once you arrive. It gives you much more freedom to get out and explore the surrounding area and, when you’ve got little kids, having your own wheels is much easier than public transport. Canvas Holidays mobile homes are also self catering so having a car makes it easy to pop to the local markets to pick up your food. Our kids actually loved doing this. They even loved going to the normal supermarket and choosing a fish for the BBQ and selecting different cheeses for their lunch. Even if your little one is a little too old for a pushchair, I recommend taking one anyway. There’s no extra charge for taking a pushchair onto the plane so don’t worry about flying with it. My three year old rarely goes in a pushchair but he used his baby brother’s all the time while we were in France. The campsite is enormous, so after a full day in the swimming pools he struggled to walk back to our mobile home. It’s also handy for afternoon naps if you go out for the day – all parents will appreciate the 45 minutes of peace and quiet while your kids sleep in a pushchair and it’s the perfect opportunity to find a nice bar and relax. Another bonus of a pushchair is that you can basically use it as a trolley to cart all your stuff to the beach or swimming pools! Towels, clean clothes, drinks, snacks, buckets and spades and other toys are much easier to push in a pushchair rather than carrying them! When you arrive I suggest you check out all the activities available and make sure you schedule them into your holiday so you do them. There’s so much going on so speak to the Canvas Holidays staff, check out the notice boards around the pools and play parks and go to the information centre for the full itinerary of activities. Then write yourself a little itinerary of all the things you’d like to do. It’s so easy to spend all day in the pool (and I’m sure you’ll do this for a few days!) but the activities are what make Canvas Holidays really special so make the most of them. At Camping la Sirene there was a kid’s evening disco everyday at 5.30pm that all the little kids went to. It was perfect for letting toddlers have a dance and a run around to tire them out before bed. I was really impressed by the amount of activities available to younger children. You often find there’s a lot going on for over 5’s but under 5’s aren’t always catered to so well. But with Canvas Holidays there were so many babies and toddlers and so many great activities for them. There’s even a dedicated activity program called Zero2Five which has activities for under 3’s with parental supervision and then fully-supervised activities for 3-5 year olds. For us, one of the main benefits of a Canvas Holiday is that you have a fully equipped kitchen so you can make all your own meals. We often find that when you eat out with young children there isn’t a lot of variety for them so they end up living on a diet of pasta and chicken nuggets! So we love being able to make our own meals. It also means you can make picnics if you’re heading out for a day, so I recommend taking a cool bag and some ice packs with you to keep your picnics fresh in the sun. There’s no denying that holidays are so much cheaper outside of the school holidays, particularly if you’re flying to your destination. Make the most of your children being pre-school age and travel outside of the school holidays for the best deals. Canvas Holidays have some incredible deals for shoulder-season travel. Not only will it be cheaper but it’s a bit quieter and it might be a good idea to avoid the mid-summer heat with little ones. Have a look here for more information on booking a trip with under 5’s with Canvas Holidays and our free Zero2Five programme.